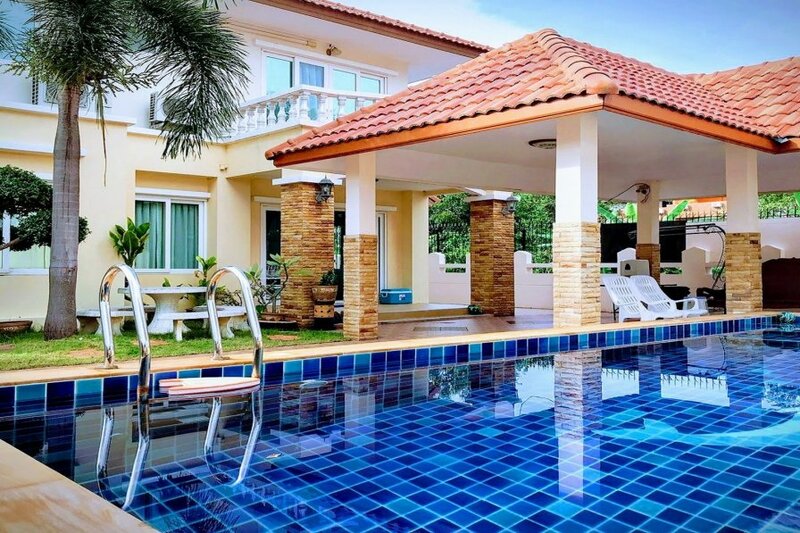 Diana Villa is an excellent holiday rental for those seeking comfort, luxury and relaxation in close proximity of all conveniences. This tastefully decorated, modern villa can accommodate families and groups of friends with up to 9 Located in the heart of Pattaya, you get a spacious 4 bedroom 2 bathroom house with private swimming pool - The house is airy, functional, and feels like home: - 2 bedrooms have en-suite bathrooms and 2 have separate bathrooms - All bedrooms have king sized beds and storage space -All bedrooms are air conditioned with high quality Japanese brand air conditioning systems. -Bathrooms all have solar heated hot water, large mirror, and plenty of counter space for your things. - A fully equipped kitchen that has plenty of counter top space for food preparation basic utensils, a microwave oven, large american style fridge, toaster, electric kettle, large sink with hot water, water filter system as well as a an electric oven and gas stove. - Washing, ironing and basic cleaning supplies are available. - You get high speed WiFi internet access, free + unlimited -We now have a BBQ available. Guest access You will have exclusive access to the entire house and private swimming pool. Interaction with guests I will be available at check-in for any questions and will offer any advice or help that you require. Taxis are plentiful and cheap and can be found on the main road 1 mins walk from the villa or ordered to the door. A motorbike taxi cost about 40 baht (1,5 euro) to the center of Pattaya / beach, also a car taxi will cost about (100 baht) (2-3 euro) use app named "Grab"
The Pattaya area has countless tourist attractions, including the following, World class golf, zip line courses, zoos, Nong Nooch tropical gardens and cultural/elephant shows, swimming with dolphins/dolphin show, floating market, go-karting, microlighting, motorcross tours, windsurfing, kiteboarding, paddle boarding, snake shows, crocodile farm, elephant villages, ATV tours, caberet shows, cinemas, ten pin bowling, cinemas, shopping malls, huge selection of restaurants serving food from around the globe, Silverlake vineyard and tourist area, Cartoon Network water park, Pattaya Park, Walking Street, Mimosa shopping village and entertainment centre, etc, etc.